Join Katie Archibald-Woodward for an in-depth exploration of her current visual and voiced storytelling exhibition "Our Home is the Holy Land". Brief comments by the artist begin at 5:45 pm, with discussion to follow. Note: Bring ear buds for listening to the audio stories. A limited number of sets will also be available to borrow. Scrumptious refreshments generously provided by Ebrik Coffee Room, Leon International Foods, and Columbia Seminary. "A documentary about life under siege" during the war in Gaza in 2014 created by journalists Max Blumenthal and Dan Cohen. Event in association with Joining Hands for Justice Palestine-Israel. Over lunch Katie Archibald-Woodward will share about her visual and voiced storytelling exhibition "Our Home is the Holy Land" then the group will walk across the (small) quad to experience the exhibit. - Bring ear buds for listening to the audio stories. A limited number of sets will also be available to borrow. Join us at Claremont Presbyterian Church Sunday, January 6 at 9 a.m. to learn about the children living in the beloved city of Bethlehem. January 6th marks the celebration of Christmas Eve for Orthodox Christians around the world as well as Epiphany for many others. As millions remember the Christ Child born this day in Bethlehem 2,000 years ago, it is also a time to consider the many children born in Bethlehem today. We will meet in Classroom 1. As you look at the big red front doors of the sanctuary (from the front patio), Classroom 1 is directly to the left of the sanctuary, just down the few steps. This walk is in conjunction with the multi-media exhibit “Through the Checkpoint”. You can experience the exhibit and walk the labyrinth, just experience the exhibit, or just walk the labyrinth. Julie Roberts-Fronk will facilitate an introduction for those who want to engage in the Labyrinth walk. The focus will be how we engage sacred space and practice, like the Labyrinth, in a way that helps us process and pray an experience, like experiencing the stories and picture of people in “Through the Checkpoint”. The Labyrinth is a sacred space to which we can bring brokenness: our brokenness and the world’s brokenness. It is a spiritual practice in which we can find the wholeness of God guiding us. The Labyrinth will remain open until 8:30. Once your walk is finished you are free to stay in the space, view the exhibit a first or second time, or conclude and return home. 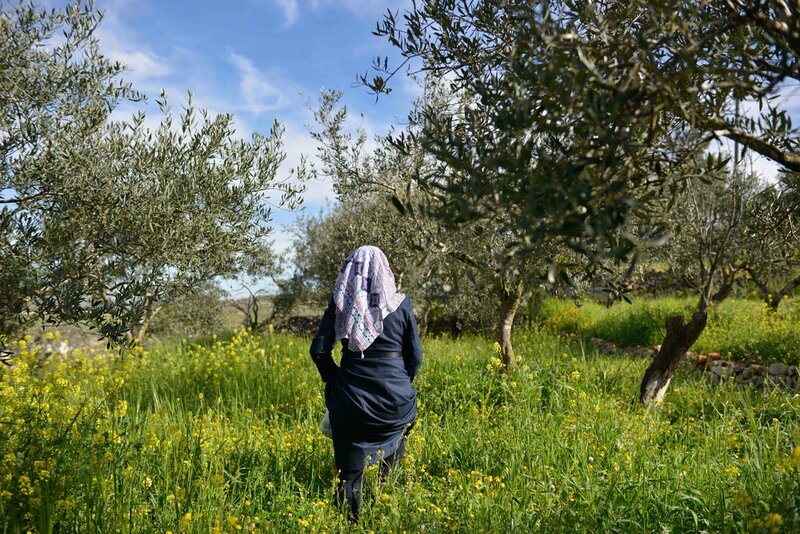 Come immerse in the visual and voiced stories of our neighbors in Israel/Palestine. "Through The Checkpoint" is a multimedia project offering vision and voice to life lived amidst the occupation. It has been created in partnership with the Creative Visions Foundation and is serving in tandem with ongoing efforts to foster justice and peace for all living in the Palestinian-Israeli region by the continued call for equity, human dignity, and the pursuit of a coexistence without occupation. Please pass the word around and don't hesitate to email me if you have any questions! "Bethlehem Through The Lives of Children"
Kinda: Okay, I drew here that we are crying a lot and we are really sad, cause we are living under the occupation and we need freedom and peace. At the same time, I love to swim and play futbol. In the future I wish to become an engineer, teach swimming, also I wish that Palestine become a happy country and me as well. Katie: imagine you are talking with a friend who lives far away. What is something you would like them to know about living Bethlehem? Kinda: I would love to say that Palestine is really a very beautiful country although we are under occupation, but Palestine is the most beautiful country. Katie: What’s one of your fears? Something you’re afraid of? Kinda: I’m afraid that one day the Israeli soldiers will take one of my family members, because I do not likeand I cannot live without my family. Katie: And, what’s one of your dreams? Kinda: To become an engineer.